There aren't a whole lot of books in English on French tanks of the Second World War. I am not sure if there are that many French language books either, most likely due to the French forces having succumbed to the Nazi onslaught in a relatively short six weeks. There weren't a whole lot of success stories on the French side to write about when it came to their tanks. There weren't any lengthy tank vs tank battles, such as on the Eastern front. There wasn't a lot of time for tank Aces to appear on the French side, though certain French units acquitted themselves well against the German panzers in limited situations. France had one of the largest armies in the world at the time, their tanks were produced in relatively large numbers, they saw combat against the invading German forces, and they lived on to fight for German forces in various anti partisan duties, together with limited use in France against the Allies in the summer of 1944 following the D-Day landings. MMP's new book is therefore most welcome. It contains over 90 black and white period photos taken by German cameramen following the defeat of the French in 1940, as well as of various captured tanks pressed into service with German anti partisan units. The book comes with a card cover and the pages measure 8.25" by 11.75". The paper used is of a matt surface, and most of the photos are well reproduced. Only a few are printed across the gutter of the book. Each photo is very well captioned. This provides a fair amount of detail for the reader about what they are looking at. 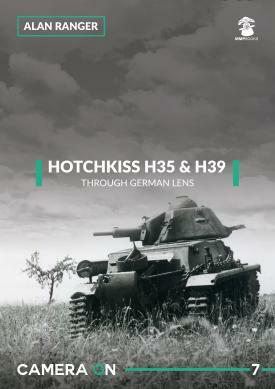 The book is divided into three main "chapters" which are preceded by a well written four-page introduction to the Hotchkiss firm and its tanks. The first chapter details Hotchkiss H35 tanks as seen on the battlefields of France in May 1940, many looking much the worse for wear! There are 28 pages, each with at most two photos per page, showing lots of detail for the modeler to absorb. The second, 25 page chapter covers the H39. Again, the photos being taken during or immediately following the Battles of France, May 1940. Finally, there is a third chapter of 12 pages which details H35 and H39 vehicles in German units, on partisan fighting duties mainly. This book by MMP should be most welcome for all modelers interested in France's World War Two tanks. The photos have a mountain of detail within them, and the captions explaining what is on view are well written and very informative. I can highly recommend this book to anyone interested in the Battles of France, German anti partisan actions, and World War Two tanks in general. My sincere thanks to MMP Books for providing Internet Modeler with a review sample.